Beach Vista , pet friendly. Fantastic views with rear and front access. A home away from home , family and pet friendly. Duel living up and downstairs. 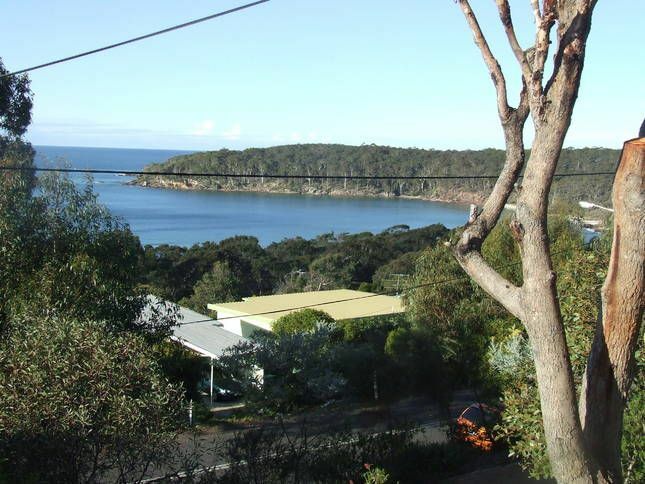 Enjoy Pambula Beach's climate and location and take in the magnificent views. The balcony is perfect for relaxing with a book and a glass of wine or just gazing at the vista. The modernised dinning and kitchen area make it a pleasure to cook in. If a BBQ takes your fancy, open the bi fold back deck windows and share the occasion while preparing dinner. The enclosed back yard makes for a safe enviroment for children and dogs, as we are pet friendly. Beach vista is a large dual living home that will suit a couple of families making it very affordable. A SC unit with Queen, Double and Single Beds, downstairs and 3 Bed rooms upstairs 2 Queen and 2 singles. The views are stunning and are so close to the safe beaches. Pambula river mouth is a great spot for kids to paddle while you catch a variety of fish and is also great for kayaking. There are two fantastic surf beaches within 5 minutes walk,one at Lions beach or at the patrolled Pambula surf beach. The access for boats is via the Pambula lake or at Merimbula inlet. A free courtesy buses can pick you up for a night out to the hotel or golf club.. The Kitchen is ready to go with a stocked pantry. Honesty system applies. The gardens attract the Kangaroos and you can feed the birds from the balcony, BBQ on back deck. Visitors to our property need to bring their own bed linen and towels. *Very comfortable beds and furnishings. * Both front and rear verandah to choose from, dependent on the wind and weather. * Safe for the elderly with back access- no stairs to climb. * A bus Pick up from the door to Pambula village hotels and golf club. * A stocked pantry- use and replace. * Any questions please ask and we will help you in any way we can. * Plenty of room self contained downstairs with toilet and shower for another family or for friends to stay. * A children barricade can be pulled across the top of the stairwell for safety. *A washing machine is available for guests and an easy to operate dishwasher has been installed for guests. The dual driveway allows for guests to turn around cars and boats. The backyard can be made secure for your dog. Original art is a feature. A book exchange or borrow is available within the home. The whole house is available to you or your group. * The safe sun deck overlooking the ocean is safe for children. Fabulous location and views. David was easy to communicate with and was perfect for a family getaway. It was lovely to host you and hope that you all enjoyed the wedding. Owens group were very clean and left our house in perfect order. Loved our stay here with our 2 dogs. Amazing views. Great location. Walk to Lions Beach. Fantastic new kitchen. Very clean throughout. Owner great to deal with. Would definitely stay here again. Fantastic location ,clean, comfy, sunny, bright and spacious. A very comfortable house with great views of the ocean. A great balcony to read;have breakfast and socialize.